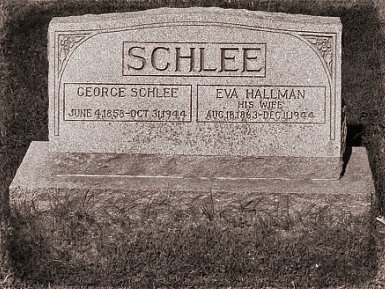 George Schlee was one of the more active builders in Berlin (now known as Kitchener) Ontario at the turn of the century. After apprenticing as a stone mason he purchased a construction firm and became the main contractor for building imposing residences and civic buildings, including the original Kitchener-Waterloo hospital and the Walper Hotel and Zion Evangelical Church. Following a visit to the US he returned home filled with enthusiasm for the potential in the manufacturing of rubber footwear and founded the Berlin Rubber Company in 1899 and later the Berlin Button Works in 1906. Built in 1907 by a Swiss couple, George and Eva Schlee, the Daisy has withstood the test of time and the storms that roll in off Lake Huron. 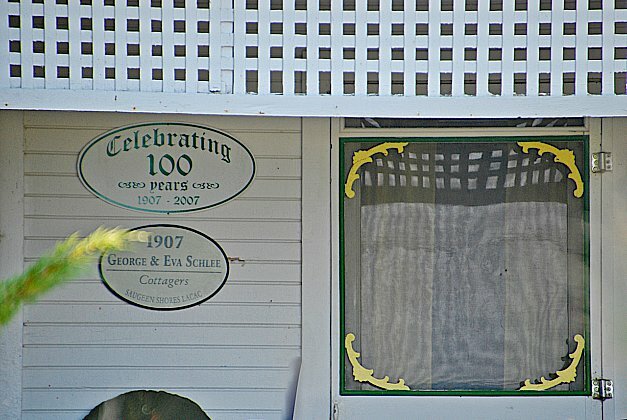 "In 1944, Ruth Van Pelt Runyan, was strolling along the boardwalk when she noticed a for-sale sign in front of a cottage. It opened immediately on to the sandy beach of Southampton and had a wonderful yard and veranda. The asking price was $4,000 ... a large sum given the year, but she and her husband, decided to take the leap and purchased the cottage." 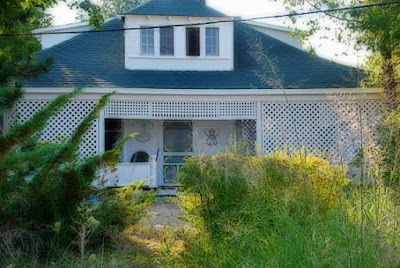 Now, 62 years later, the Runyan family is still spending summers in the Daisy. A wrap-around veranda provides a cool breezeway on hot summer days while the interior and furnishings are reminiscent of days gone by. "The kitchen floor has a definite slant and the wicker furniture is original," points out Marjorie Runyan, 87. "I remember a time when the beach was all natural with beautiful sand dunes, but all that has changed. Some politician, in his or her wisdom, decided to strip the beach of the dunes in the name of progress and now we have the eternal problem of blowing sand that fills every nook and cranny. I studied geology when I was at university and I can't understand why the beaches are being treated this way." This post all started by taking a photo of this bench, and the cottage behind. That house sure is a looker! If you are going to be building, you might as well make your home a showpiece. 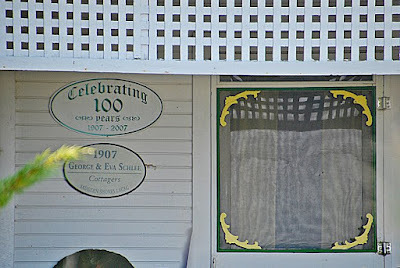 I bet George would be proud to know several generations of the same family have been enjoying his cottage. 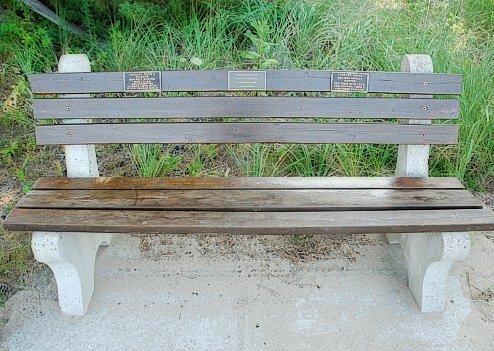 Those bench dedications are so sweet and poignant! And what a great history the family has there. Very sad about the destruction of the dunes. Sometimes change is not a good thing. The dunes are still there, so not completely destroyed. But they are perhaps in a much smaller area than decades ago. I am always pleased when I can find so much history. I suppose it's a sign of the times, but the 'his wife' on Eva's side sounds so possessive to me. A very interesting history. Thanks for sharing. What a lovely story! And all from noticing a bench. I'm blaming Jude for the 'bench obsession'! How great that you took the time to do some research after checking out that bench! 'Thats a good' article, i usually amazed with' this thing, i asked myself about this opinion, I wish You'll a better articles that can make another people impressive..don't make the article feel rigit and isn't interesting and poor, i like to read this' article and i think this is "good".thank you' m'y brother.